Travel beyond the beaten path and explore multiple modes of transportation to see Jasper's natural splendor!! Imagine a time when there were no roads through the Rockies and the train was the only way westward. Be a part of history and join us on Via Rail’s Skeena line! During this 2.5 hour trip to Dunster BC. from Jasper you will witness incredible the scenery from the comfort of your train car. A fully certified interpretive guide will meet you upon arrival at the Dunster Station and provide you with a fully narrated tour back to Jasper. 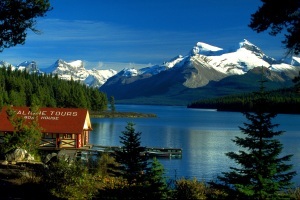 Stops include Mount Robson, the highest peak in the Rockies, and Rearguard Falls. Where at the right time of year you can witness the end of a long journey by the Chinook, where they have travelled upstream for 1200 km, in the Fraser River. 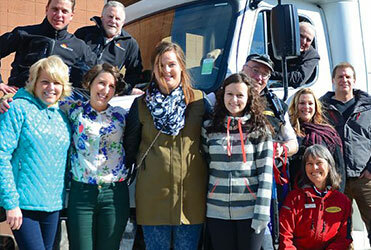 This amazing tour is a guided interpretive drive up the Maligne Valley. Our exploration will include a stop at Maligne Canyon for a gentle guided walk to the first two bridges above the gorge, a short stop at the “disappearing” Medicine Lake, and finally Maligne Lake. At this picturesque gem of the Canadian Rockies you will relax aboard the famous Maligne Lake boat cruise to Spirit Island. The Maligne Valley Tour is mainly a nature, scenic, and geological voyage but it is also an excellent opportunity to see some of Jasper’s wildlife. Boat Cruise included in the price. *Due to time constraints these tours cannot be booked on same day. Multi-day selection is provided through our "Book Now" option.